I have a feeling this is not the last post of the year, but I’ve started to wind down and start reflecting on what needs to be done in 2009. Given my close relationship with the NLH I have often used them to compare TRIP against. Over the years we have exchanged positions regarding usage but since we fixed the speed on TRIP I’m delighted to see us pull away. 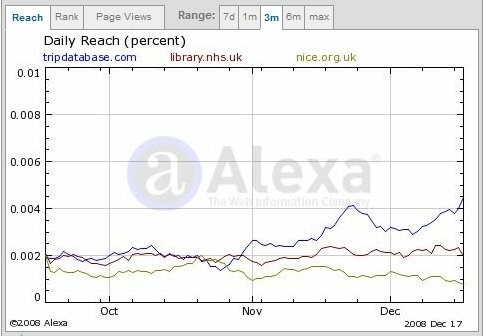 In the graph below (click on the graph for a clearer view) you’ll see I’ve added NICE as well (given that they are merging with the NLH in April 2009 to create NHS Evidence). 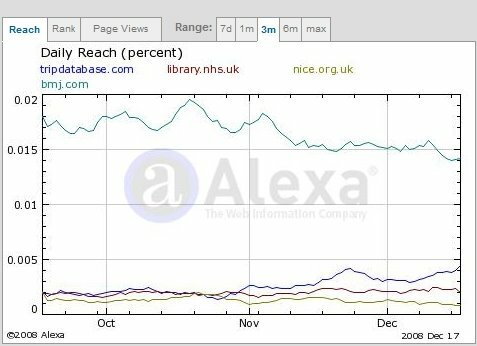 However, while I’m pleased we’re doing well, I acknowledge it’s all relative and the graph below shows us – pitfully small – in comparison with the BMJ! NHS Evidence will bring some serious innovation into play to pressure us to innovate. In fact, the desire for innovation isn’t restricted to just NHS Evidence, I want to see serious innovation everywhere. We close the gap on the BMJ.